In Ravnica, control the secrets, and you control the city. I have secrets, if they were to be used correctly, they may allow you to control all of Ravnica. Use them friend. Go with this information and claim the city, mold it as your own. anothers gaze will be watching you from the darkness. Tell no one what you learn here, or perhaps your secrets will soon become theirs…. In all of Magic, no setting is more interesting to me than Ravnica. This will be the third trip to Ravnica we’ve taken, but for those not familiar, the plane of Ravnica is a super city, organised into 10 guilds who’s leaders have signed a pact to live in a delicate peace. This Guildpact protects the delicate balance of the plane by giving each guild a job to perform in the maintenance of the plane. The result of this from a story perspective is that each guilds unique personality is often seeping from the cards. The flavour throughout Ravnica blocks is always super deep, and I’m very excited to be making a return trip. The bonus to all the times we’ve visited the plane is Wizards has had the time needed to really put the work in developing a rich tapestry for how each guild should “feel” on the cards, and it really comes through in the designs and mechanics of Ravnica cards. Wizards also somehow always puts powerful, sometimes format defining cards and mechanics into the game when we have a picnic on the City Plane. On that note, Ravnica is responsible for my favorite, (and probably the most broken) mechanic in Magic : Dredge. This powerful graveyard mechanic has been a reason for graveyard hate in sideboards for a very long time. The (play for free if they’re in your opener) Leylines series also came from the original Ravnica block, and of course, most importantly, the Shock Lands, which see play in every format they are legal. 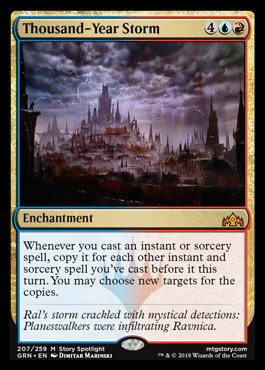 Ravnica’s influence is visible throughout every eternal format in magic, and in Commander as well. Because I prefer formats like Modern and Commander, my focus will be on how these cards may work in those formats. I won’t be focusing on Standard for these picks. There are plenty of resources online to help Standard players out there figure out what the newest hotness is going to be, and what you’ll be playing for the next few months, so to that end, I’ll leave it to the professionals. So with that said, lets get started with a few honorable mentions that I think are going to be fun, see play somewhere, but aren’t at the top of the Ravnica pile. This card on its surface is nothing to write home about. The rate for Discovery is perfectly fine for its effect, and Dispersal may be good in some corner case situations. The reason this card interests me and lands in my mentions is because it was combined into a split card. Because of the way the rules of Magic work in terms of CMC on cards, this card is 7 CMC. The only time this changes is when one side of the card is cast and the spell is on the stack. Because of this rule, I believe that the Discovery side may be worth testing as a reasonably efficient card draw and graveyard filling card in Living End. Living End wants to avoid any of their cards being less than 3CMC because the deck relies on their Cascade cards only hitting Living End. This card fills an important role that I believe the deck was missing on turn 2, so I wouldn’t be at all surprised to see some amount of experimentation with this card in modern lists. 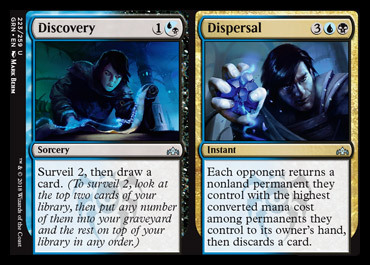 As a fan of fringe (and sometimes unplayable) decks in Modern, I always appreciate interesting established decks getting cool new tools to try out, so Discovery makes the list. Punisher effects in Magic (effects that let your opponent chose the outcome) are often considered to be poor. The opponent is almost always going to pick the effect that hurts their game plan the least and leave you with the sub optimal option. Risk Factor caught my eye for a few reasons. First off the rate for both effects is totally reasonable. 4 damage for 3 mana at instant speed is fine. But the jump-start is what really interests me. If you have followed Dredge in Modern for the past few years, you’d know that Cathartic Reunion was a huge boost to the deck as it lets you pitch a dredger before its card draw occurs. 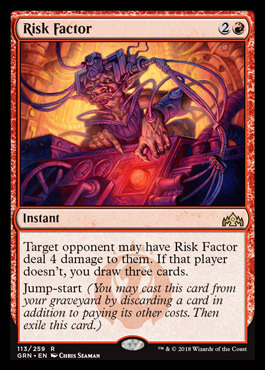 Risk Factor being instant speed means you can pitch a card to its effect at the end of your opponents turn. They are now in a difficult spot. Do they let you dredge now and possibly build a board, or do they just take 4 damage immediately. For a deck like Dredge that can hammer out damage very quickly and in high volumns, that choice may be a damned if you do, damned if you don’t situation. When we’re considering anything for Modern Dredge, a big factor is mana cost. 3CMC or lower is often all the deck can handle or it risks flooding out. The decks run very lean and will often try to close the game out using only 3 lands. If Risk Factor happens to be dredged into the bin, you aren’t concerned, and are arguably happy to have the additional discard outlet, that can be activated at instant speed. Anytime dredge is able to interact at end of turn, it can get out of hand quickly, with the right cards going into the bin creating a wave of pseudo hasty creatures for the opponent to deal with. 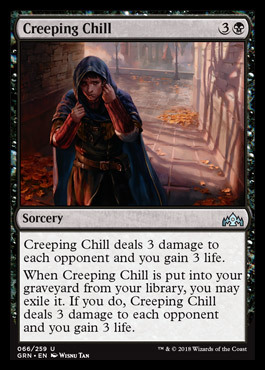 Creeping Chill, has an interesting free effect if it’s dredged into the grave from your library, draining the opponent for a not insignificant 3 life. This gives the deck a form of reach that can also help it fight matchups like Burn and Aggro. This role is often left to the sideboard Gnaw to the Bone, that can gain a pile of life, but doesn’t pressure the opponent. This card is a different beast, since it actually pushes the game plan forward while incidentally gaining life. I don’t know if this particular card will make the cut in dredge, or a dredge variant, but the effect is very cool and is almost certainly worth testing out. If you are familiar with Fleshbag Marauder, Plaguecrafter is a clearly influenced by that card. However, the powercreep on this version is amazing. 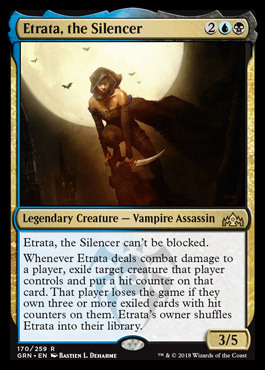 The addition of “or planeswalker” to this card is already a huge upgrade, allowing decks running this card in the main board to have game against control strategies who’s aim is often to land only a powerful planeswalker and let it run away with the game. Then, as though that weren’t enough, if you play this before your opponent hasn’t landed a creature or planeswalker, you still get value out of it by forcing them to discard. This card is a bit of a mystery to me. I have no idea if it is a “modern” card, but it checks off quite a few boxes. Solid enter the battlefield effect, reasonable body, no way to not get your mana value, even in top decking situations. You can be quite certain you’ll see it at standard tables, it will almost certainly make it into Commander lists everywhere, and if my instincts are right, this card is going to find its way somewhere in Modern. Alright, so we’ve taken a little walk down memory lane and seen the cards that didn’t make the cut, so now we have the Guilds of Ravnica cards that I think are likely to be powerful or fun enough to see play in Modern and Commander games. Let me start by saying, sadly I don’t believe this card is Modern playable. as a 3 mana creature that has no effect on entry, it’s very likely far too low power for the format. That said I really love this card in Commander. To be honest, I love this effect in commander in general. Nothing is more fun than playing with your opponents carefully selected cards. The body is small enough and non-threatening enough in a big game of Commander that you are likely only going to see it die when a boardwipe or something similar occurs. Meaning you may get 1 or 2 hits in. The bonus being you are going to be able to cast the cards exiled with it regardless if it lives or not, and this evolution of the Specter creature type at least lets you cast those spells for any color mana. Speaking of cool creatures. Etrata is a very interesting design. This card screams Commander to me. I don’t currently know how to build around the shuffle effect on this creature, but the fact this can be a Commander gives you an expensive way to work around it by default. Very interesting design from Wizards, and will more than likely end up wandering around Commander games in the hands of adventurous players. Divine Visitation is another crazy effect for Commander. Turning every token created into a 4/4 Angel is an incredibly unique and powerful effect. I expect this card to see play in Commander decks just looking to generate angels for an unfair price in a multitude of ways and colors. Now, for a more unique take on this card. One of my pet decks in Modern has always been Mono-White Prison. Although there are almost certainly other effects that trump this to finish the game, I love the idea that a white prison deck could run token generators and have this card as a top end. Allowing for a fun beat down end game. The fact this effect is unilateral is the biggest boon to maybe fitting into a niche modern shell. Won’t top tournament tables, but may be just cool enough to fit somewhere fun. Speaking of niche shells, Doom Whisper is such a difficult card to evaluate. At a glance, there is no question this demon is powerful. a 6/6 Flying Trample for 5 with no drawback is unusual in Magic history. 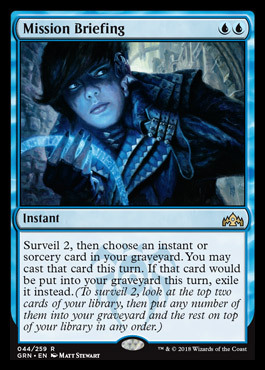 But the repeatable Surveil ability on this card is the most interesting, and possibly broken element. One of my pet cards has always been Necrotic Ooze. If we put a Doom Whisperer into the graveyard and land a Necrotic Ooze, we’re able to start paying life to freely dump cards into our graveyard. Ooze’s biggest advantage is that it can turn into a one creature combo once a particular variety of creatures has landed in the graveyard. So with proper setup, you may only need to activate the Surveil ability a few times to get the creatures you need in the bin to suddenly end the game. While unlikely to win a major tournament in this shell, Doom Whisperer is a very strong card, and the fact it works well with one of my favorite cards in magic is a huge upside in my book. Alright, here we go. 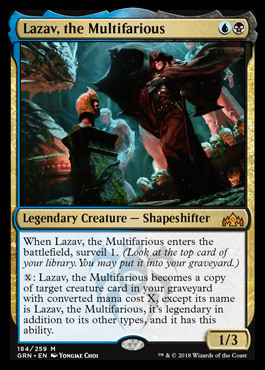 When Return to Ravnica was released, I was absolutely loved Lazav, Dimir Mastermind. Cloning creatures as they went into the graveyard seemed like such a cool effect. I found myself sticking it into a variety of Commander decks and copying all sorts of crazy cards. Unfortunately he was expensive, hard to cast, and you had to choose if you wanted to switch him to a new creature everytime a new one went in the bin. This normally isn’t an issue, but it did lead to multiple situations where I’d think “Man, I wish I stayed as Creature X”. The newly printed leader of the Dimir offers a much more interesting build around me ability. Being able to switch on the fly to mimic any creature in the middle of combat will keep your opponent wondering how they deal with him, especially when you can suddenly switch to a cheap hexproof or indestructible creature to get around all their removal options makes our Multifarious friend incredibly slippery and hard to remove as long as you use your mana wisely. I have absolutely no idea where this creature fits in various formats, he’s incredibly cheap, has a reasonable body, a totally fair enter the battlefield effect, and his ability is super unique and powerful with all the powerful undercosted creatures in Magic. This is the card on everyone’s lips. Assassin’s trophy draws parallels to Abrupt Decay, which has been a multi-format all star since its release. Where decay has the draw back of only dealing with threats 3 CMC or less, and can’t hit lands, Trophy takes away all of those restrictions letting you deal with literally anything at all, including lands. Of course this doesn’t come without a downside. If you abrupt decay a mana dork, the opponents mana is restricted and you have gained some amount of tempo. If you Trophy the same dork, you’ve provided your opponent with a land, and possibly fixed their mana in the process. Removing some threats can often be the difference between winning and losing a game. One issue with Path is that it only answers creatures, and as magic has gotten older, the threats have become more diverse, and some are cheating their mana costs making decay just miss them completely. Tasigur, Gurmag Angler, Hollow One. Path handles these, but all three dodge the other premier creature removal in the format, Fatal Push, and equally dodge Abrupt Decay. Karn Liberated, Ugin, Aether Vial, Enchantments (bogles……) and a string of other threats without even counting the actual Tron lands. These are all threats that if unanswered, likely will lead to a game loss. While Trophy handles all of these easily, like all removal in Magic, if you aren’t able to back it up with a legit threat of your own, the best removal in the game will ultimately do nothing for you, and giving your opponent lands is not something to take lightly. 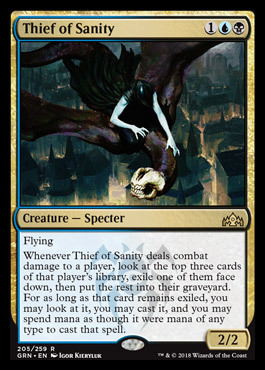 I’m very interested in seeing where Modern and Legacy as a whole land with the printing of Assassin’s Trophy. 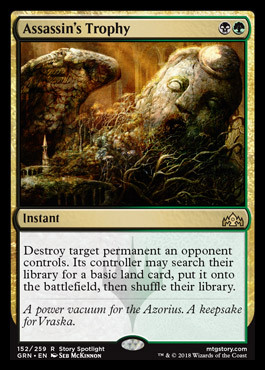 The fact Abrupt Decay is uncounterable makes it a main stay in Legacy where Force of Will keeps people in check, I’m interested to know if Trophy is powerful enough that people will run it and risk having it countered. In Modern, I expect that it will become a split of main deck and sideboard answer in any deck that runs Green and Black without question. This card will have a 100% impact on Modern. Since we’re on the topic of Modern staples, Knight of Autumn is a heck of a creature. There is never a bad situation for this creature. If you are ahead on board this is a 3 mana 4/3 that can continue to pressure your opponent. If you are behind in an aggro race, gaining 4 life and putting a creature to trade on board with can be a big swing in your favor and may allow you to stablize. Then, just for fun, Reclamation Sage’s ability is tacked on. Rec Sage already lands in the sideboard and sometimes main deck, of a few modern decks as a clean answer to troublesome Artifacts and Enchantments, and Knight of Autumn can be hit by Collected Company. 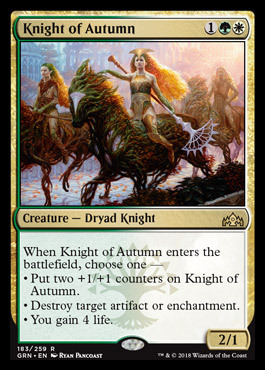 The real question with Knight of Autumn is if its going to be a sideboard or maindeck creature, and in what numbers. Because there is absolutely no question if you play GW in modern, you will want to run into this creature somewhere in your 75. There are quite a few people comparing Mission Briefing to Snapcaster Mage. Obviously this is quite a big pair of shoes to fill. So lets take a look at the pieces of the pie and see how they stack up. So the biggest upside to Snapcaster is the fact it leaves behind a 2/1 body. Many times the body is enough to close out the game in the right deck. Obviously this is an area Mission Briefing is lacking. Snapcaster players also know the worst statement an opponent can make when you cast it “Targeting what?”, this is almost always followed up by an instant speed exile effect taking away the target, making snapcaster a crappy Ambush Viper. This is where Mission Briefing shines. The surveil being first on the card, and part of the resolution means you can add additional fuel to your graveyard, possibly netting you an answer that wasn’t previously there, and doesn’t require targeting a specific card. So even if your opponent has an instant speed effect to disrupt you, you will always get some value out of your spell. This card will be tested in modern without a doubt, but it’s hard to know where it will land. As a janky side note, Polymorph decks got a nice addition with the printing of this card. Because these decks require having no creatures except your game winning Emrakul, this card suddenly gives that deck a pseudo Snapcaster for a counter spell, without the “downside” of being a creature. Clearly this is the most important use for this card. The last card I want to take a look at is possibly very powerful, and seems to be incredibly underrated. In Magic one of the most powerful things you can do is tutor for a card in your deck. Mausoleum Secrets has a few things really going for it, and a few downsides as well. First off, lets be clear this card isn’t Demonic Tutor reborn. 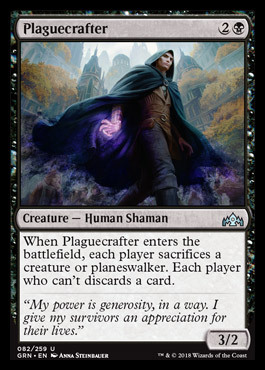 This only tutors for black cards, so the options are significantly more limited than many other black tutor effects. A big plus however is this tutor is an instant. Almost every black tutor effect in magic is sorcery speed, leaving the card vulnerable to your opponent having discard effects, or anticipating what you searched for and playing around it on their turn. Because you can play this at their end of turn, it allows you to find very high impact cards, that you can immediately untap and play. The difficult part to evaluate about this card is what piece of what puzzle are you searching for. There is no deck that this currently slots into without some downside. Looking over the modern format, there really isn’t a shell that this card just goes right in and you’re off to the races. I believe that’s why I saved this card for last, and why it interests me the most of all the new cards. Its a design that encourages outside the box thinking in order to make a home for it. The card may be powerful enough that it’s worth building your deck completely around it. I currently have zero idea what I’ll be doing with it, but I have a strong feeling my brain will be churning to figure out somewhere it can call home soon.